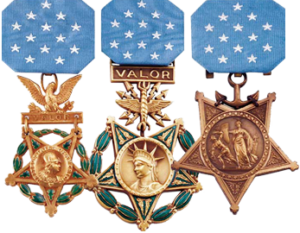 The Silver Star Medal is the United States’ third highest award exclusively for combat valor, and ranks fifth in the precedence of military awards behind the Medal of Honor, the Crosses (DSC/NC/AFC), the Defense Distinguished Service Medal (awarded by DOD), and the Distinguished Service Medals of the various branches of service. It is the highest award for combat valor that is not unique to any specific branch; it has been bestowed by the Army, Navy, Marine Corps, Air Force, Coast Guard, and Merchant Marines. It may be given by any one of the individual services to not only their own members, but to members of other branches of service, foreign allies, and even to civilians for “gallantry in action” in support of combat missions of the United States military. On February 22, 1932, the date that would have been George Washington’s 200th birth day, Army Chief of Staff General Douglas MacArthur revived General Washington’s “Badge for Military Merit (1782)” as the Purple Heart. That same year he also successfully advocated for conversion of the “Citation Star”. When his recommendation was approved by the Secretary of War, the 3/16′ silver star was converted from a ribbon device” to a full-fledged medal. The Silver Star Medal was designed by Rudolf Freund of Bailey, Banks and Biddle, and consisted of a gilt-bronze five-pointed (point-up in contrast to the point-down design of the Medal of Honor) star bearing a laurel wreath at its center. The ribbon design incorporated the colors of the flag, and closely resembled the medal’s earliest predecessor, the Certificate of Merit Medal. The reverse of the medal is blank, save for the raised text “For Gallantry in Action”, beneath which is usually engraved the name of the recipient. The gold hue of the gilt-bronze star seems at odds with the award’s name, Silver Star. That title derives from the medal’s World War I lineage and the 3/6″ silver star, once displayed on a victory ribbon, and now prominently displayed in the center of the medal. The Silver Star Medal remained exclusively an Army decoration until August 7, 1942, nearly a year after World War II began. On that date the Silver Star Medal was expanded by Act of Congress for award by the Navy Department for actions on or after December 7, 1941, (Public Law 702, 77th Congress). We estimate that the number of Silver Stars awarded World War I to present is somewhere between 100,000 and 150,000. While that number seems quite large, when compared to the more than 30 million American men and women who have served in uniform during that time period, it is obvious that the Silver Star is a rare award, bestowed on fewer than 1 in every 250 veterans of military service.